The French comic actor Coluche was a dyedin- the-wool cyclist. In 1985, he joined a team sponsored by Elf in order to realize his greatest ambition - becoming a world speed record holder. Coluche didn't treat his ambition lightly. He devoted himself to the task of becoming a record-breaker as though he were rehearsing one of his famous comedy sketches. He made his attempt on the famous Nardo circuit in southern Italy, choosing a Yamaha 750 OW 31, prepared by Pierre Boudon, as his mount. The bid was backed by Elf, since only a manufacturer could hire the circuit. The first attempt on the record, in August 1985, ended when the motor seized up. a record flying mile speed of 157.28 mph. After this, it seemed certain that Coluche would participate in Elf's 1986 record attempt. 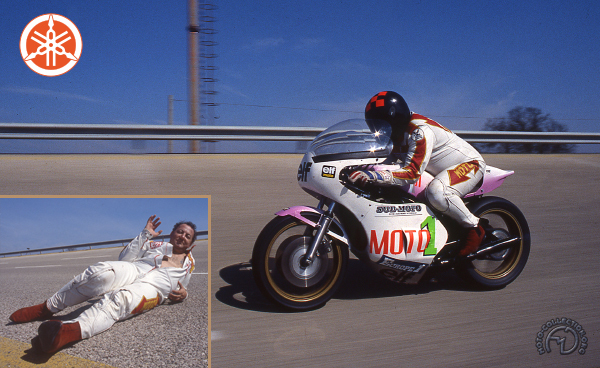 He took part in the initial trials on the Castellet circuit that April, but the humorist-turned-cyclist never made it to the actual attempt - an unfortunate accident in June 1986 took his life. The initial difficulty was how to compress the 208lb. comedian into his racing leathers and fit him behind the fairing of the Yamaha! But Coluche the racer was no laughing matter.